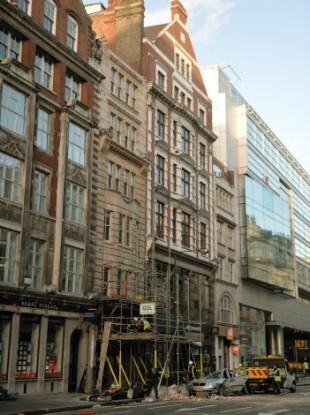 Workmen clear debris at the scene in Kingsway, opposite Holborn Tube station in central London, after a woman, named by police as Julie Sillitoe, 49, was killed when large chunks of masonry fell from the building above the Hiba restaurant on to her car. SODDEN COMMUNITIES ALONG the River Thames braced for more floods on today, as Britain counted the cost of a storm that claimed several lives and left tens of thousands of homes without power. At least two people were killed in separate incidents in Britain and the English Channel after violent winds and heavy rain swept in from the Atlantic on Friday. Prime Minister David Cameron warned yesterday that the worst was not yet over as he visited the Thames-side village of Chertsey, west of London, to see how the military were helping bolster flood defences. “What we do in the next 24 hours is vital because tragically the river levels will rise again. So every sand bag delivered, every house helped, every flood barrier put in place can make a big difference,” Cameron said. More than 3,000 members of the military are involved in the flood relief effort, according to the defence ministry, as the government seeks to counter criticism that it was too slow to respond to the crisis. Fourteen severe flood alerts warning of a risk to life were in place along the River Thames on Saturday night, with another two issued for the southwest of England, which has borne the brunt of two months of heavy rain. In a newspaper interview published today, opposition Labour leader Ed Miliband blamed climate change for the run of bad weather, and urged government ministers to treat global warming as a “national security issue”. Cameron said last month that “I very much suspect” there is a link but said that either way, there should be more investment in flood defences. Friday’s violent storm pulled up trees, sent roofs flying off buildings, slammed waves into the coast and opened up a 20-foot (six-metre) sink hole in a quiet street in Hemel Hempstead, north of London. A 49-year-old taxi driver with three children was killed when a building collapsed onto her parked car in the centre of London, and her two passengers were injured, police said. Out on the English Channel, an 85-year-old man died after high winds sent a “freak wave” smashing through a window of a cruise ship off the coast of north-west France, the ship’s operator said. Email “Britain braces for more flooding today”. Feedback on “Britain braces for more flooding today”.